As fishermen, we were sick and tired of our fillet knives going dull, rusting, pitting, slipping out of our hand and not being able to hold up in a harsh saltwater environment. We wanted a knife that could handle a rigorous life at sea. After searching for this perfect knife, we found that one did not exist anywhere, for any price. That's when we set out to make the best fillet knife possible. After consulting with many other fishermen with multiple prototypes over the course of a year, production began on what we think is the Ultimate Fillet Knife™. The end result is a set of fillet knives that stay sharper longer, resist rusting, and hold up under the harsh environment of saltwater fishing. 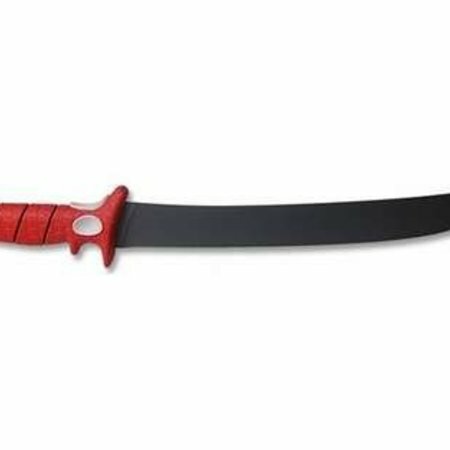 The Bubba Blade also has a handle that is safer and easier to grip. This new patented no slip grip handle was created so that there is protection from the blade and protection from the spines of fish like Scolpin. When filleting fish on the back of the boat, hands covered in blood and fish slime you need to be able to bear down on the knife without the fear of your hand slipping off the handle easily.